We took off in Blackbeauty and the first day we made it up to Colorado Springs, CO, and by the second day, we were up north of Ogden, UT at a little town called Tremonton where we spent the night. Shortly after lunch on the third day, we made it into Boise and got to visit with our friends. Fann and Jeannie went out of their way to show us a great time. We visited the ski resort, made the downtown sidewalk cafes, checked out the nature center, bicycled the paths along the Boise river, went to the Western Idaho State Fair, and had some great meals. We left Boise heading for the Canadian Rockies. Angie thought that we'd make much better time and get to see some of Idaho's mountains if we just headed North out of Boise instead of taking the interstate off to the West and up. I finally gave in and we headed up through Cascade and on to Highway 95. We spent the next six hours or so admiring the Salmon river while stopped at one-way traffic routes. (It seemed like the whole road was under construction.) I must admit though, that we did see some interesting and pretty country along the way. 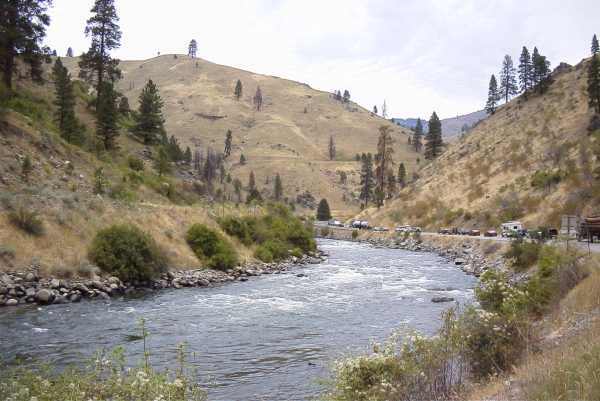 We are parked on Highway 95, admiring the Salmon river while stopped on a one-way traffic stretch. (It seemed like the whole road was under construction.) Note all the vehicles stopped in front of us! We hunted up a nice little state park called Round Lake up close to Sand Point and spent one more night in Idaho, camping this time. 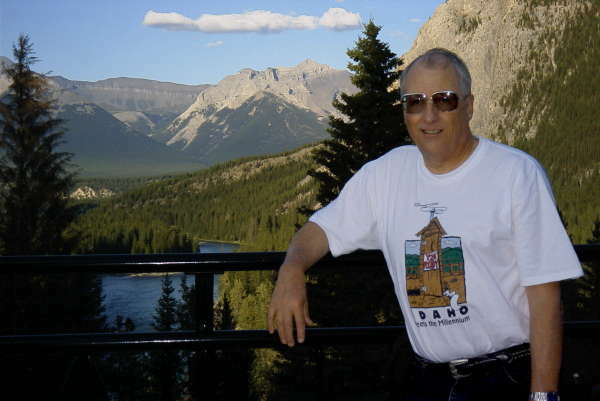 The next morning we crossed over the border and headed for Banff National Park in Canada. Entry was a snap thanks to the annual park pass given us by Larry and Laura Pitt. I sure am glad Larry got to see this place with Laura before he left us! It's truly beautiful. 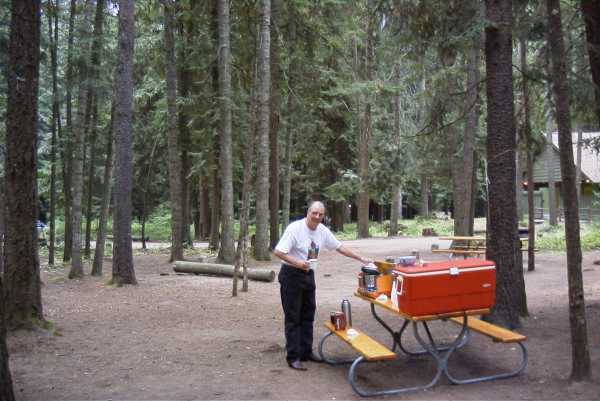 Here I am making the morning coffee in the campground of Round Lake State Park in Northern Idaho. The next stop was in the city of Banff. 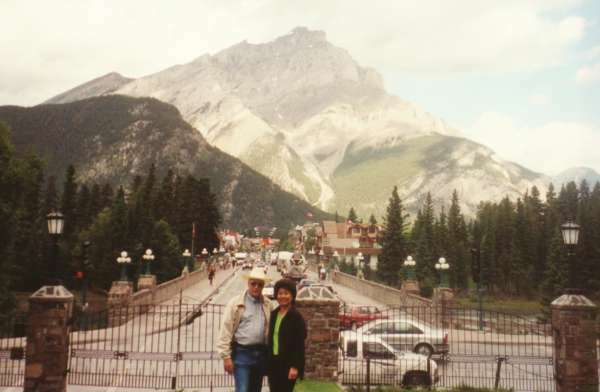 We made all the usual tourist places, from the Banff Springs Hotel (Now the Fairmont Banff Springs) to the cave. 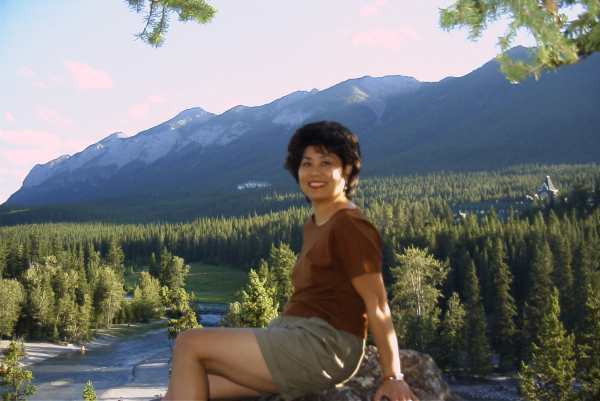 Here's Angie relaxing on the lookout above the Bow River, with the Banff Springs Hotel in the background at the right. Here's a shot of the hotel itself. It's quite a place as you can see. The view from there looks out on the bow river valley, and is spectacular. 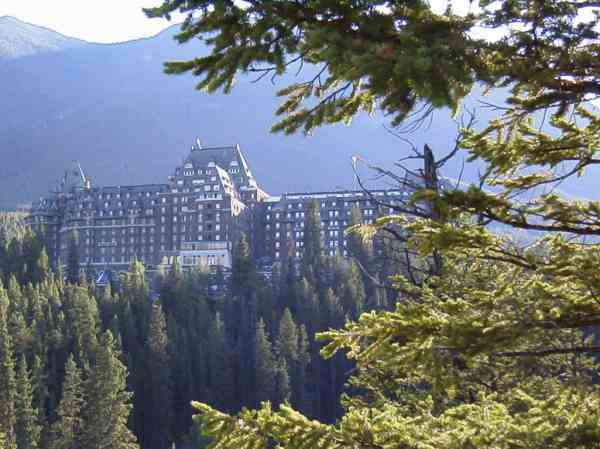 We visited the Banff Springs hotel and enjoyed the view from the Patio. Nice digs! It seems like everybody has a picture taken at the Banff Visitor Center looking down the main street toward Cascade Mountain. Now we do too!